You live out of town, without access to a pharmacy or drug store - what happens when you break a nail, or need to give yourself a manicure? 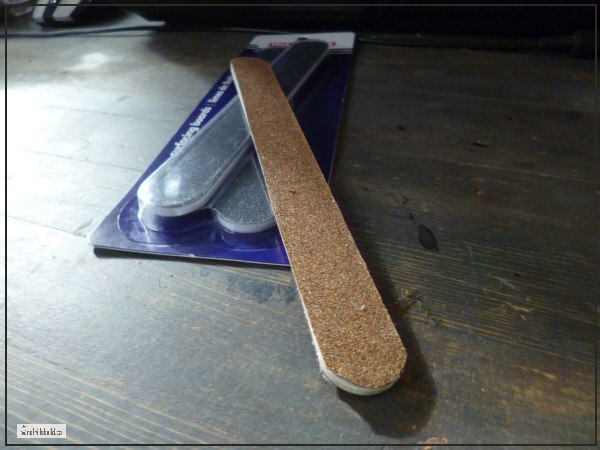 How about learn to make your own emery boards with some supplies you most likely have on hand? 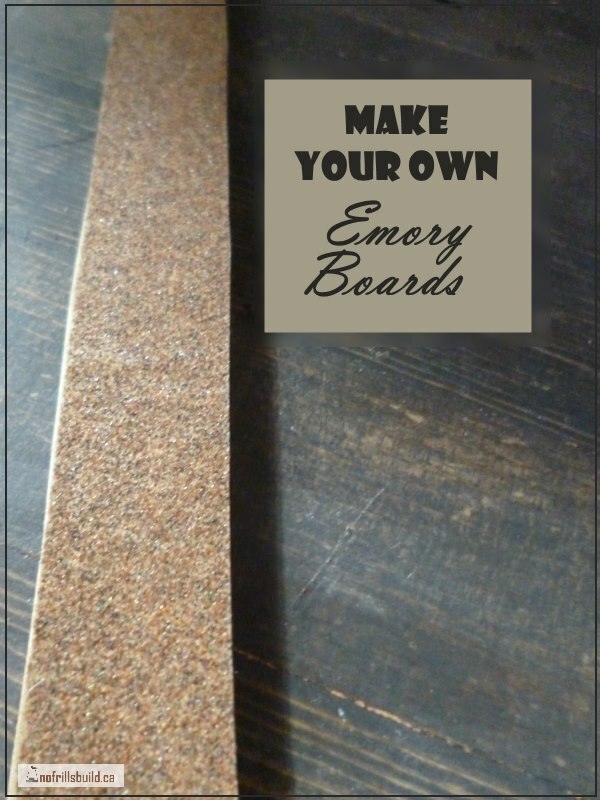 I needed a nail file, to smooth off a rough nail and stop it from splitting further, but I had no emory boards in the medicine cabinet - so I made my own. Then I discovered what a rip off it is to buy them and I'll never buy them again! It's useful to keep your worn out emery boards for the base, or use a tongue depressor or piece of cardboard cut to the shape. The nice thing about making your own is that you choose the right grit to use - it's sandpaper after all. It comes in all grades, from rough to smooth. The cost for several sheets of sandpaper is under $7 - the price of two surfacing boards from the drug store is around the same price! I put two different grades on mine, so I can start with the rough filing, then move to the smoother finishing grade, just like sanding wood. The one I show here is made with 120 grit garnet paper. You'll need some glue (I used Mod Podge Waterbase Sealer for mine, you could use carpenters glue or whatever you have handy). I got my sandpaper from the hardware store, but here is some from Amazon that is similar. You can get an assortment of different grits in one package. Put the glue right to the edges of the sand paper which you've cut out to the shape. Glue both of your pieces - the base and the sandpaper. Then carefully match them up, stick a book on them to weigh them down, and let it dry. Do you have shelly, easily broken nails that never seem to grow? There is no product that you can apply topically to fix this, no matter what the cosmetic companies say. You can, however, give your digestive system something to help. It's called digestive enzymes, or plant enzymes. This is the brand I've found that works so well that I can use my formerly weak and breakable nails for tools! Weird but true. The brand I use is NOW Foods Plant Enzymes, 240 Vcaps .